This is the second meal using the peri-peri chicken and brown rice. To read about the first recipe using the chicken and rice, click here. To learn how to make peri-peri chicken sauce, click here. Since your chicken and rice are already made, this dinner can be made in less than 30 minutes! That includes the prep and cook time for the kale chips! Cook once, eat twice strikes again! Preheat oven to 350 degrees. Lay kale leaves on a baking sheet. Drizzle with olive oil and salt and bake for 15 minutes. Meanwhile, build your wrap – first place the brown rice in the center of the tortilla. 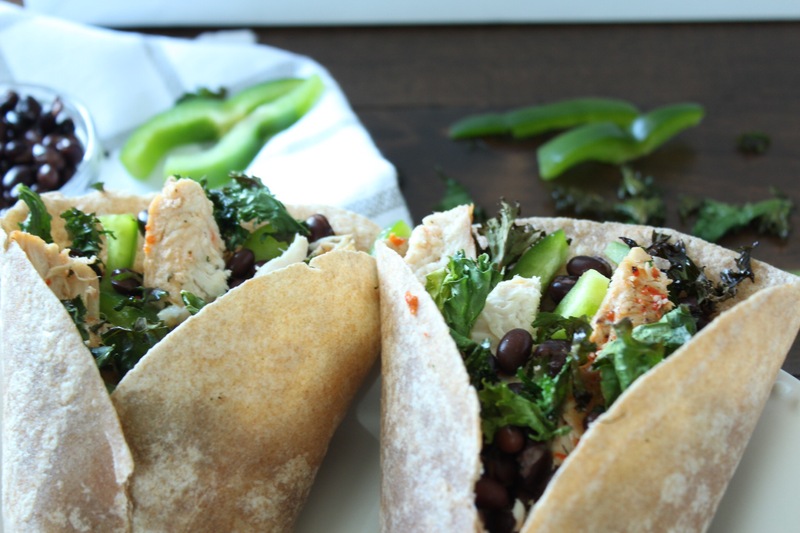 Top it with bell pepper, black beans, grilled chicken, and kale (once done cooking). Fold the bottom of the tortilla tightly, tucking in the sides.